The AARP Credit Card from Chase currently has an Informr score of 8 out of 10. This score is based on our evaluation of 15 sources including reviews from users and the web's most trusted critics. AARP Credit Card from Chase is typically available to those with good credit scores (650 or greater). 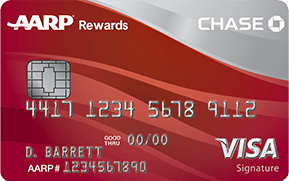 With no annual fee and an easy sign-up bonus, the AARP Credit Card from Chase is one card that’s worth considering. It’s especially compelling if you frequently use your credit card for gas station or restaurant spending. This card is a great deal, in keeping with all of the other good financial products AARP offers. This card offers a cash-back program that competes well with other top cash-back rewards cards such as the Bank of America Cash Rewards Visa Card. Ideal for heavy spenders who drive and dine out frequently. It’s also great for people who want some of their spending to go toward a worthy cause, though it’s important not to overstate the magnitude of AARP’s charity donation. The sign-up bonus and is very attractive too. The AARP Credit Card is worth a look if you eat out a lot, drive a lot or, best of all, both. AARP is known for the senior discounts it has won for its members, and this card continues that tradition. It pays an unlimited 3% cash back at restaurants and at gas stations. Three percent would be a pretty good rate in those categories for any card, but it’s excellent on a card with a $0 annual fee. The AARP card, which offers strong rewards on categories such as gas and restaurant purchases, is an ideal choice for post-retirement road trips. However, don’t expect a huge windfall from this relatively basic cash back card. The AARP Credit Card is for a specific type of spender: one who eats out regularly and spends a lot on gas. Key is the card’s 3% cash back at restaurants and gas stations, which is an excellent rewards rate. If your spending is dispersed evenly throughout different categories, you might want to pick a different card. The AARP Credit Card from Chase offers sizable rewards for people who love to eat out and fill up at the gas pump. The 3% cash back rewards on restaurant and gas purchases is better than what most rewards cards offer. Plus, cardholders don’t have to jump through hoops to figure out the points system as there are no category spending requirements or limits on how much you can earn. The AARP credit card from Chase is an excellent no annual fee card that has some great bonus categories for purchases. It may not be that well-known or come with all the bells and whistles that some premium Chase rewards cards offer, but it’s still a great cashback card that’s worth your consideration. While the AARP Credit Card from Chase may be branded with a retirement organization’s name, the card is available to everyone. Good thing, too; it’s cash back rewards are among the best you can find. This cash rewards credit card has industry-leading rewards on certain types of purchases but you rarely see the card mentioned among the best-in-class.